Wed May 25, 2016. 8-10pm. 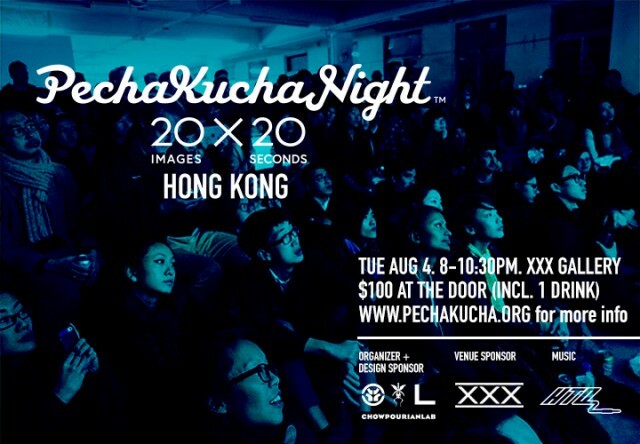 We’re back with a classic un-themed PechaKucha Night HK! Tue Dec 1, 2015. 8-10pm. 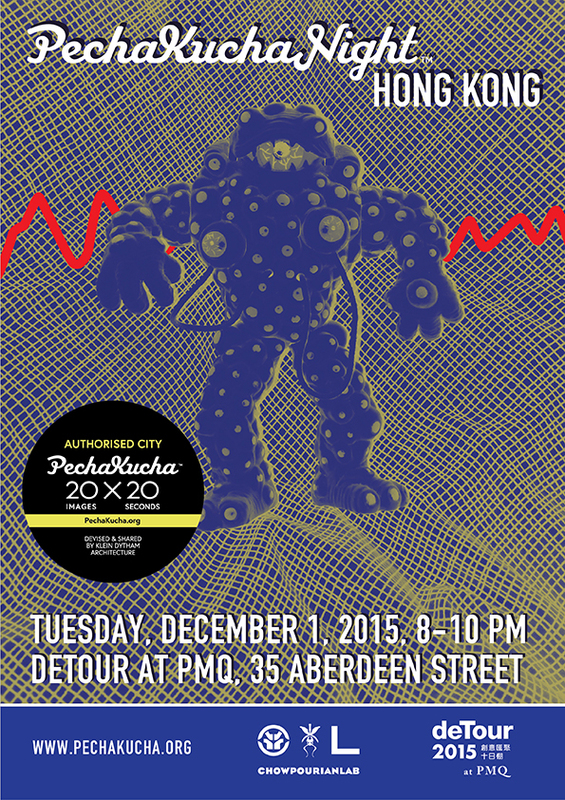 deTour is “a ten-day fest celebrating innovation” which runs from November 27 to December 6 at PMQ. Named “one of the most exciting events on Hong Kong’s cultural calendar” by CNN, deTour is an annual event which aims to build a platform for international and interdisciplinary cultural exchanges, through a selection of local and international designs. 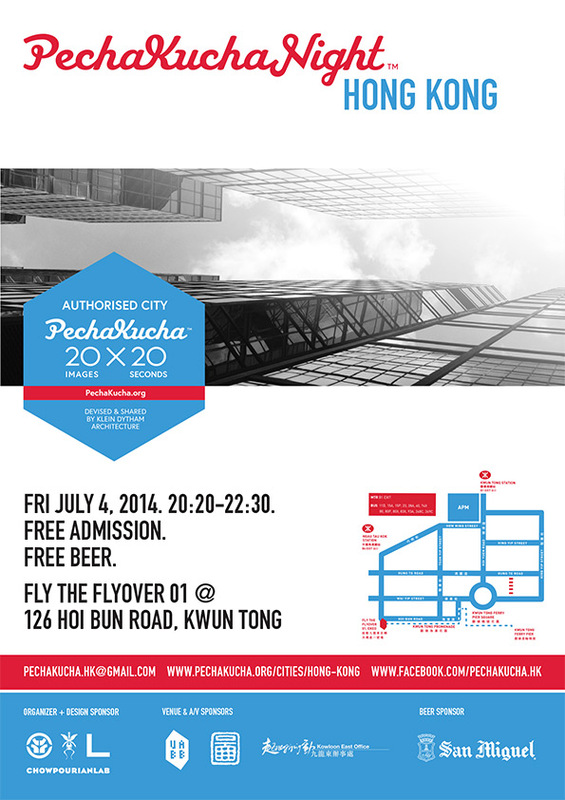 PechaKucha Night Hong Kong has been organised by ChowPourianLab since 2012. Tue August 4, 2015. 8:00 - 10:30pm. We’ve taken a short break, and now we’re back with an uninhibited theme-free PK! Director / screenwriter Joanna Bowers introduces her current work, a timely tribute and documentary about domestic helpers in Hong Kong. Anna Cheng walked away from a career as an interior architect to open a contemporary fine jewellery gallery showcasing international artists and designers. She’s also a certified diamond grader and is the 4th generation in a family of jewellers. Architect and urban planner Tat Lam is the co-founder and CEO of a social development incubator to empower grassroots communities in rural China. Nadine Bubner escaped the corporate world and now heads up a full-time business teaching yoga and meditation classes while indulging in Ironman triathlon competitions on the side. Kyle Ford is an American artist and photography professor with a special interest in large format film. His work has been featured in publications, galleries and museums internationally including Popular Photography, Elle Men China and Newsweek Japan. Calista Goh dabbled in psychology, business, law and pastrymaking before finding herself on a mission to combine Western technology with ancient Oriental healing wisdom. Doug Woodring is the Founder of Ocean Recovery Alliance, a NPO which focuses on bringing technology, collaborations and policy together to improve the health of the ocean. Patricia Choi is an interior architect and design educator. She is also the founder of two Hong Kong-centric enterprises: one is design-based and focuses on local day-to-day objects and street mentality; the other, a creative residence for short and long-term stays which offers an alternative authentic HK experience. Jess Jacobsen is Programme & Campaign Manager of The Women’s Foundation, a non-profit organisation dedicated to improving the lives of women and girls in Hong Kong. She discusses the influence of media on gender stereotypes and self-perception, and shares how this has affected her personally. Self-described adman by day and by night, Kevin Lynch returns to the PechaKucha Night HK stage to share more adventures about using Airbnb to live in, work in, and discover Hong Kong. 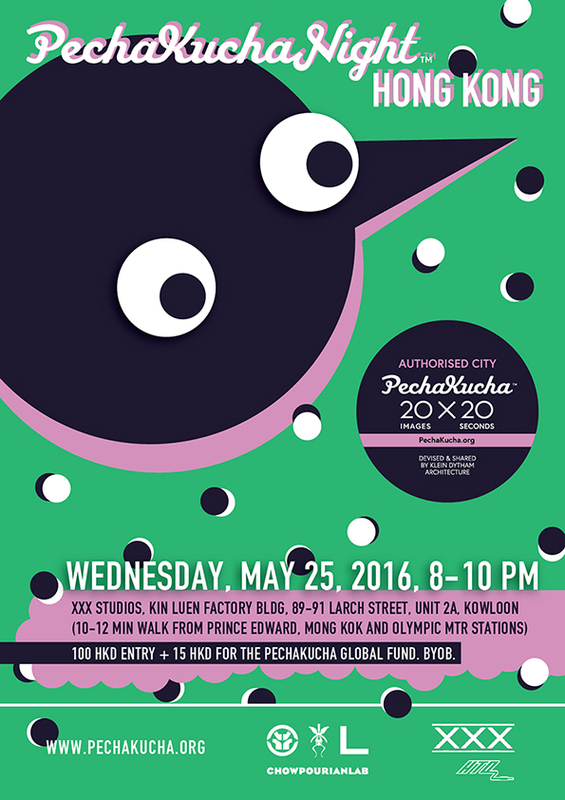 PechaKucha Night is a live networking event for sharing projects, stories and inspiration. Now in 850+ cities, all presentations follow the same signature format of 20 images x 20 seconds. From emerging talent to established professionals, anyone can take the floor. The event series began in Tokyo 2003, the brainchild of Klein Dytham architecture. Tue March 3, 2015. 8:00 - 10:30pm. 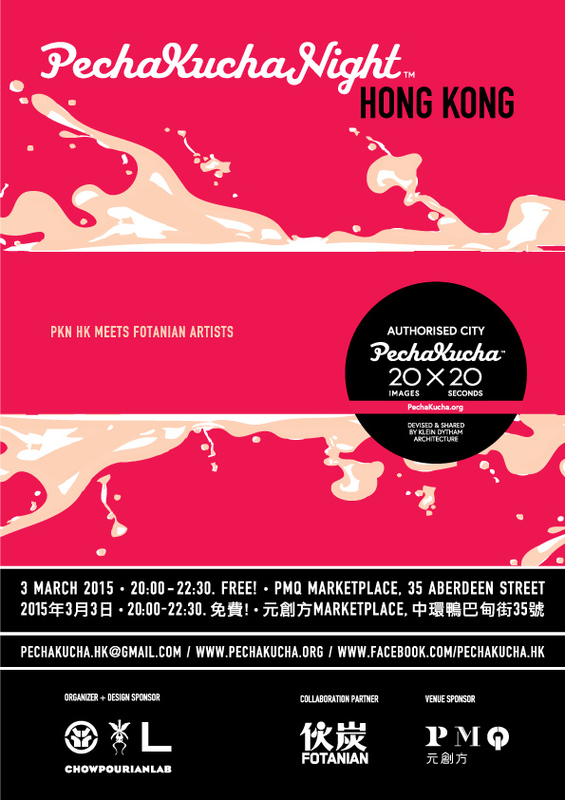 PechaKucha Night HK rings in the Year of the Goat in a special collaboration with Fotanian, as they get pumped for Fotanian Open Studios 2015! Get a sneak peek as a cross-section from 9 disciplines share their inspiration and stories, representing a vibrant community of over 250 artists. PechaKucha Night was devised by Klein Dytham architecture in Tokyo, 2003, as an event for young designers to present their work. Now in 750+ cities worldwide, the event has one simple rule: stick to the signature format of 20 images x 20 seconds. From emerging talent to established professionals, anyone can take the floor. The Fotanian Open Studio event brings together a vibrant community of artists and art lovers who transformed industrial lofts into art studios. With the migration of industries to the Mainland, our local creative have started to take refuge in the spacious lofts of vacant industrial buildings since 2000. Fotanian Open Studio Programme is a major annual event in the local art scene. Every year in January, artists throw open their doors in several consecutive weekends to welcome the general public. We get to go behind the scene and explore their creative works, which encompass a wide array of media, including paintings, sculptures, ceramics, mixed media, printmaking, installations, photographic and video works. Visitors can freely explore the artists’ workplace and hear about their artworks and art-making techniques. To foster sharing and exchange of ideas, visitors are also encouraged to engage in friendly dialogues with the artists in an approachable and open atmosphere. With over 88 studios and over 250 artists joining hands this year, the Fotanian community is growing at an unprecedented scale. Fri Jul 4, 2014. 20:20-22:30. PK MIX / WILD CARD! Working toward bilingual communications… So far all but one of our presentations have been in English, but Cantonese presentations are welcome! 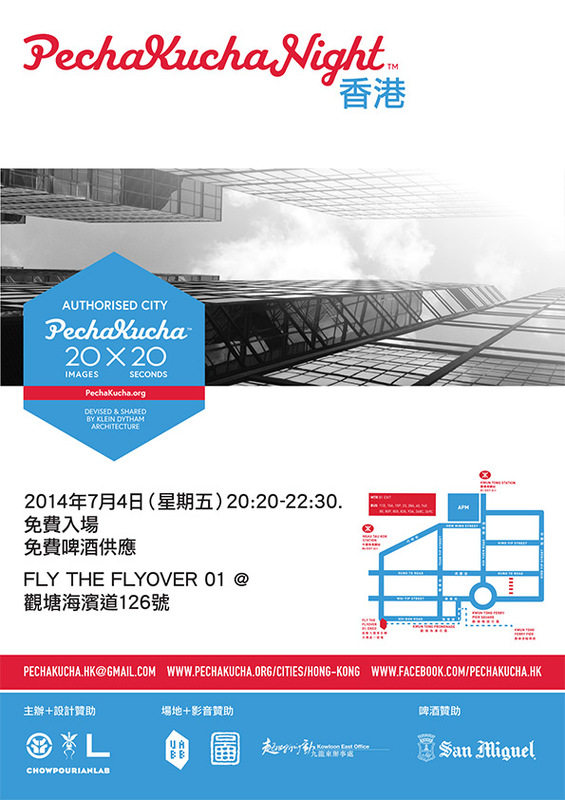 PechaKucha Night HK in Cathay Pacific’s inflight magazine! Four-page article on PechaKucha Night HK by Kate Whitehead in the November 2012 issue of Silkroad, DragonAir / Cathay Pacific’s in-flight magazine for Asia-Pacific. Happy to be featured! © CHOWPOURIANLAB. ALL RIGHTS RESERVED.